There’s an old man who sits in my local coffee shop all day. I probably didn’t notice him the first few times I ran in for a latte, but I bet he was there. He’s always there. Reading a newspaper and holding a pen, sometimes making notes in the margins. He wears thin silver glasses, wispy white hairs, a navy blue sport coat over a blue striped shirt and a navy blue ascot around his neck. I think that’s what made me notice him, at first – the ascot. I didn’t think much about him, initially. Just, you know, cool ascot. But the coffee shop days wore on, and I started noticing. I noticed that he likes ginger cookies. His thin lips rarely smile, and his Roman nose is always gloriously beet red. His thin pocket square slumps down in his breast pocket like a deflated dream, barely visible except when he leans over his paper to catch the small print. He’s always getting up and sitting back down, teetering around the coffee shop with a slow purpose, it seems. He chews with his mouth wide open and throws stray pastry crumbs on the ground. He’s got lots of stray crumbs. This man often makes me smile, as I sit and work and sip. He also makes me sad. Who is this man? What are his stories? Why does he sit in this coffee shop, day after day, wearing his sport coat and ascot? What is he writing in those margins? Letters? Short stories? Nothing at all? I don’t know. He interests me. I hope his life is happy. I hope he’s got a nice family. Somehow, I’m not sure that’s true. Watching him makes me thankful for my own life, loves, family. I guess that’s all I really mean to say. 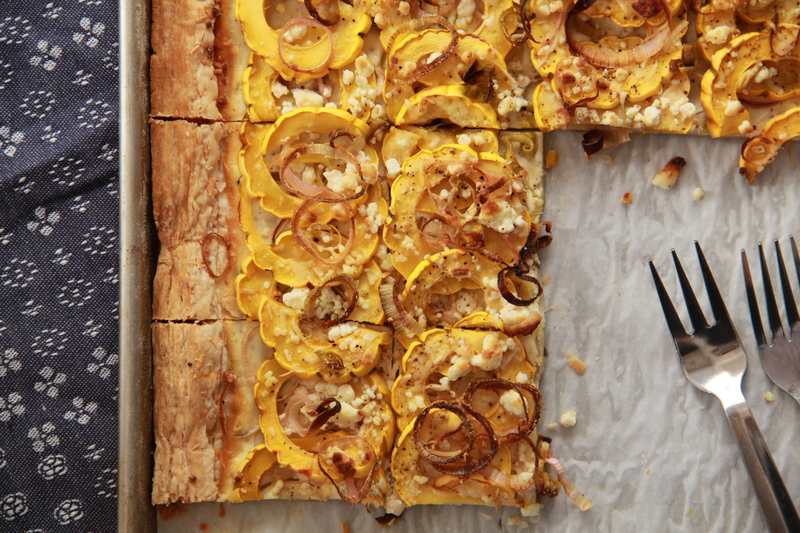 All of which has nothing to do with this cheesy leek and Delicata squash tart, except that I made it for my love of a sister, who was here visiting over the weekend. We ate it warm for dinner alongside bowls of creamy carrot potato soup, then snacked on it cold the next day, like leftover pizza. It’s definitely better warm, but when you’re snacking and gossiping with your visiting little sister, it turns out it doesn’t much matter. 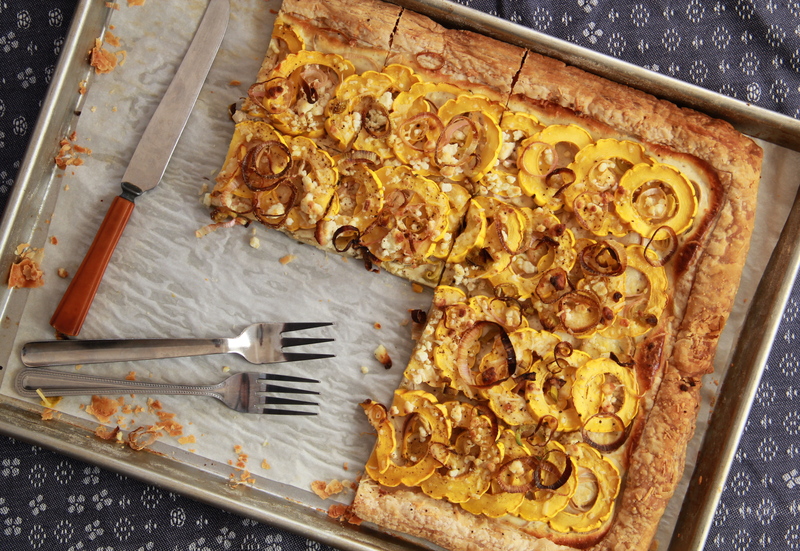 If you haven’t yet cooked with Delicata squash, it’s time to try it out — Delicatas have gorgeously speckled, very thin skin, which means you don’t have to bother peeling it before slicing and baking it into this simple and beautiful tart. Its sweet and mild flavor pairs nicely with mellow leeks and creamy goat’s cheese. Heat oven to 375 degrees F. Line an 18 x 13 rimmed baking sheet (also called a jelly roll pan) with parchment paper. Sprinkle a work surface with flour, and gently unfold the puff pastry onto the surface. Dust the dough with more flour, and gently roll it out, using a rolling pin, into a large rectangle, so it fits snugly in the prepared pan. We want to make sure that, even though it’s no longer frozen, the puff pastry is still very cold — if it gets warm, just place it in the fridge or freezer and let it chill until firm. Gently transfer the rolled dough from the work surface to the parchment-lined baking sheet, and place the whole thing in the refrigerator to chill while you prepare the rest of the tart pieces. In a large- or medium-sized bowl, beat together the cream cheese and the Greek yogurt (I used an electric mixer) until silky. Add the egg and continue to beat until smooth and incorporated. Stir in the herbs de provence, salt, pepper, lemon zest and nutmeg. Set this mixture aside. Once chilled, remove puff pastry from the fridge and use a sharp knife to score a 1-inch border around the outer egde of the dough (don’t cut all the way through, just about halfway). Spread the cream cheese/yogurt mixture on top of the dough, inside the scored border. Sprinkle half of the sliced leeks over the creamy mixture, then arrange the squash slices on top of the leeks. Top squash with the remaining leeks, Parmesan and goat cheese, and sprinkle a pinch more salt and pepper on top of it all. 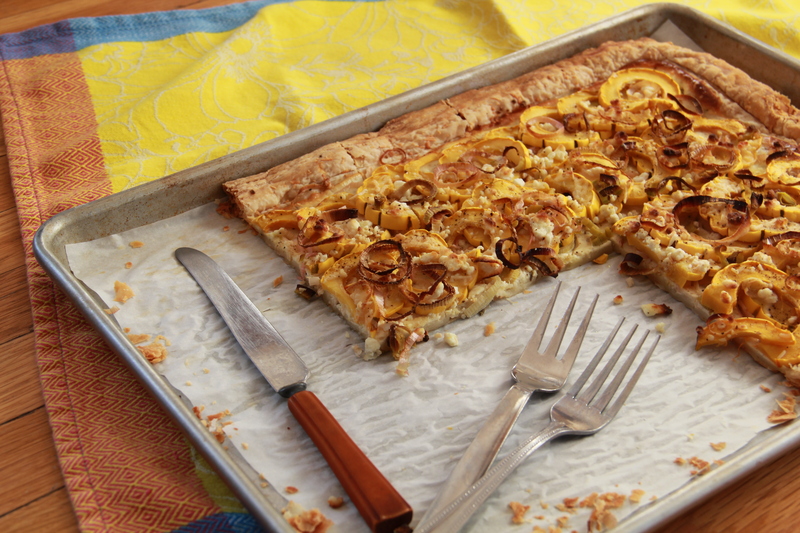 Bake the tart 35-45 minutes, until leeks and squash have browned and the crust is deeply golden. 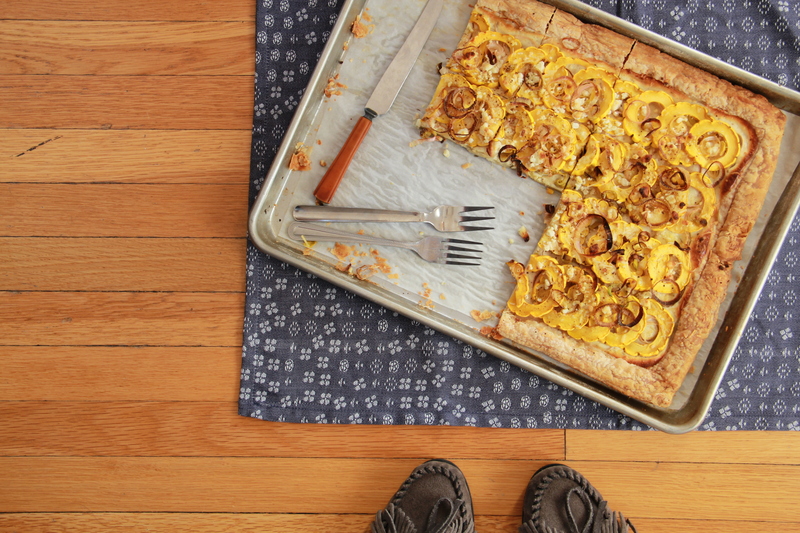 Allow the tart to cool slightly before slicing into squares and serving warm. Makes one large (18 x 13 inch) tart. Coffee shops are the best for people watching. Also- delicata squash just may be my favourite ever. I love low maintenance food! Sounds delicious, I look forward to trying it. I’d love the carrot/potato soup recipe too. Hope you had a great weekend with Casey and are enjoying time with your parents. Love your blog! Happy New Year! Thanks, Deb! Happy new year to you!